In the fields of sustainable development and conservation, research is usually done on terrestrial deforestation and land use. Marine biologists Shimrit Perkol-Finkel and Ido Sella, of Israel-based SeArc Ecological Marine Consulting, have built their conservation work around the preservation of often ignored urban marine habitats. "The city does not end at the shore," they proclaim; while only 15% of the Earth's land surface is in coastal zones, 60%of human population lives and interacts with seas and oceans. Infrastructure put in place to support coastal urban areas modifies shorelines and facilitates the introduction of invasive species, causing marine habitat and biodiversity loss throughout the world's shores. 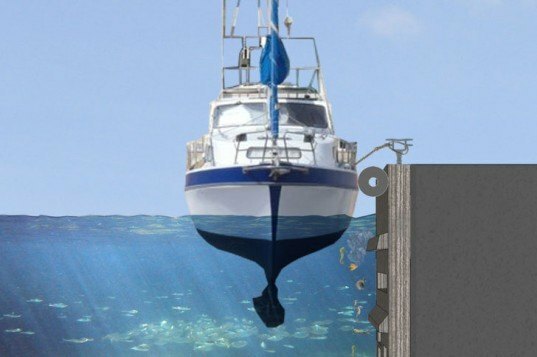 To bridge the need for urban marine development and sustainability, SeArc has created a series of modular infrastructure building blocks made from ECOncrete, an ecologically active concrete product that can serve as a host to sea organisms without compromising infrastructure needs. Marine infrastructures create severe stress on natural ecosystems, namely through shoreline degradation and erosion near coastal population centers. The shifting and blocking of land masses at the shoreline reduces accessibility and habitats for marine animals, plants, and humans alike. 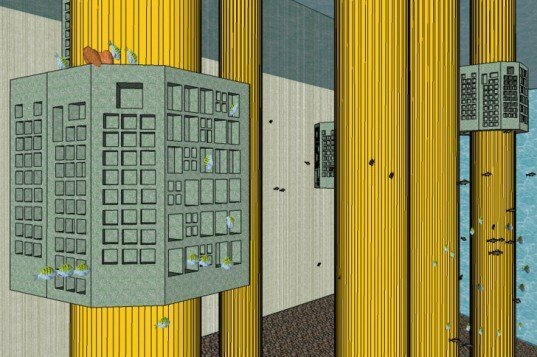 The resulting habitat loss and reduced biodiversity is exacerbated by the proliferation of invasive species that are more resilient to concrete structures such as piers, jetties, pile foundations, and sea walls. The invasive species are introduced via vectors such as ship ballast water and aquaculture byproducts, as well as other human activities. Besides imposing severe burdens on coastal ecosystems, the effects of marine urban infrastructure and invasive species can cause extensive cleaning costs to the trading and fishing industries. So how can we continue to develop our urban coasts while preserving local marine habitats and biodiversity? The solution lies in decreasing the ecological footprint of coastal and marine infrastructures. Several strategies can help mitigate the environmental consequences of infrastructure projects; habitat rehabilitation, ecological engineering and habitat creation, and sustainable management and monitoring of marine structures can be combined into a myriad of site-specific projects and programs that reintroduce native species, modify habitats to simulate native conditions, or help eradicate or control invasives. The next step in the sustainable development of ports and other coastal infrastructures is centered around literally combining environmentally active infrastructures. SeArc has previously engaged in projects to manage and activate existing marine infrastructures. Projects have ranged from monitoring and managing invasive species in the Northwest coast of Italy, to the use of breakwaters and oil platform jetties as scaffolding upon which metal cages provide better growing media for, algae, corals and small reef environments. Marine infrastructures are usually made of concrete, which due to its high pH, low porosity, and lack of structural complexity is a poor substrate for biological agglomeration; thus, other materials present more successful growing media. Learning from these experiences, Perkol-Finkel and Sella have developed ECOncrete, a variant of traditional construction grade concrete that provides a place where marine life can thrive. Precast ECOncrete modules have a lower pH than common concrete, which encourages enhanced biogenic buildup in the form of calcium carbonate deposits. These deposits, formed at an accelerated rate due to the material’s chemical composition, stimulate colonization and growth of small coastal organisms. Surface texture of ECOncrete structures is more porous and its surface less smooth than most finished concrete, providing crevices for deposits and organisms to settle in. On a larger scale, ECOncrete components are designed to furnish fish and other larger organisms with a non-uniform profile, modeling the surface to allow for nursing grounds, nooks to hide from predators, and habitats for water filtering organisms. 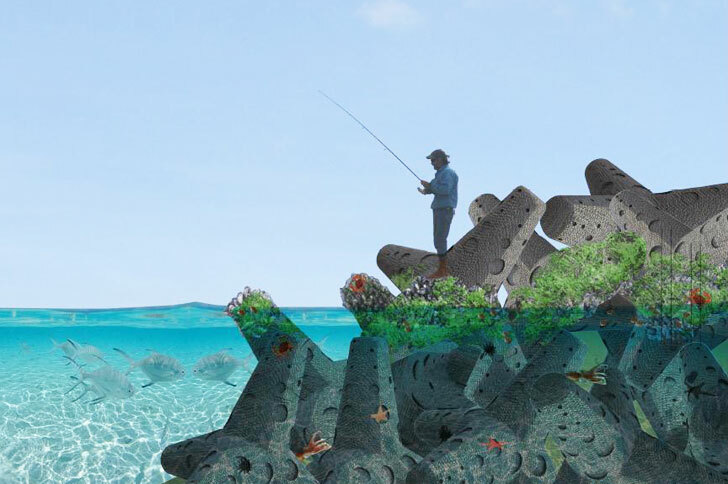 Essentially, ECOncrete structures simulate coral reefs and rocky coastal habitats while incorporating into marine infrastructure without compromising its traditional functions. SeArc has partnered with landscape architecture firm Studio Urbanof to create prototypes for different ECOncrete modular components, designed to plug into different kinds of urban marine infrastructure. Ecological armor units, based on currently used concrete tetrapods deployed along the Israeli coast, are arranged into piers and other breakwater formations that leave continuous pathways between components for fish to swim along. Rip-rap modules consist of concentric shallow pools that can be placed along tidal zones, forming or extending marine nursing habitats. Sea walls are best incorporated at marinas and ports, providing a variety of notches for bivalves and other coastal organisms to colonize. Additional modules for ECOncrete units include fish habitats integrated with pile foundations for piers, and a terrestrial green wall that actually allows vines to take root upon the wall surface. SeArc understands the value of preserving biodiversity threatened by human activity and cities, whether on land or in the sea. It's an artificial reef or shoal. We've done this before. Marine infrastructures are usually made of concrete, which due to its high pH, low porosity, and lack of structural complexity is a poor substrate for biological agglomeration; thus, other materials present more successful growing media. Learning from these experiences, Perkol-Finkel and Sella have developed ECOncrete, a variant of traditional construction grade concrete that provides a place where marine life can thrive. Precast ECOncrete modules have a lower pH than common concrete, which encourages enhanced biogenic buildup in the form of calcium carbonate deposits. These deposits, formed at an accelerated rate due to the material's chemical composition, stimulate colonization and growth of small coastal organisms. Surface texture of ECOncrete structures is more porous and its surface less smooth than most finished concrete, providing crevices for deposits and organisms to settle in. On a larger scale, ECOncrete components are designed to furnish fish and other larger organisms with a non-uniform profile, modeling the surface to allow for nursing grounds, nooks to hide from predators, and habitats for water filtering organisms. 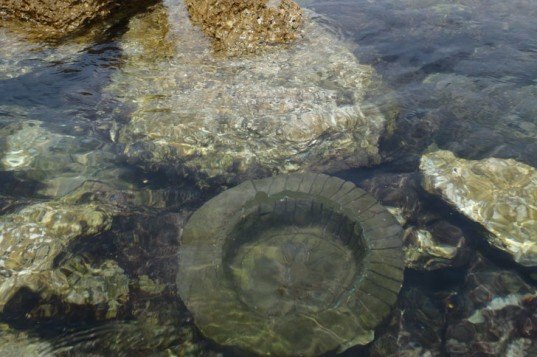 Essentially, ECOncrete structures simulate coral reefs and rocky coastal habitats while incorporating into marine infrastructure without compromising its traditional functions. 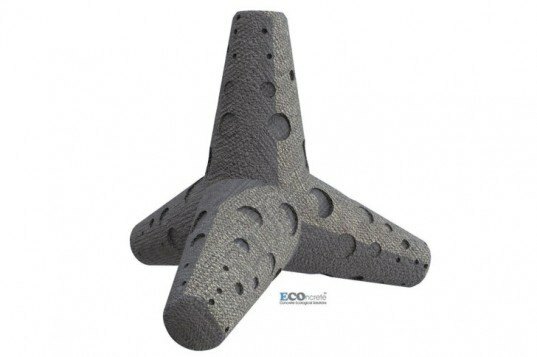 SeArc has partnered with landscape architecture firm Studio Urbanof to create prototypes for different ECOncrete modular components, designed to plug into different kinds of urban marine infrastructure. Rip-rap modules consist of concentric shallow pools that can be placed along tidal zones, forming or extending marine nursing habitats. Additional modules for ECOncrete units include fish habitats integrated with pile foundations for piers, and a terrestrial green wall that actually allows vines to take root upon the wall surface. SeArc understands the value of preserving biodiversity threatened by human activity and cities, whether in land or at sea.